Drum roll!!!! Guess What???!!! I am pleased to announce Jessie Hurley, owner of Cherish the Thought will be hosting another cruise...this time we are going to HAWAII!!!!!! Wow! We don't have dates or details except that the cruise will be September 2012. We will be sailing from Vancouver, have a few days at sea, then cruise around the Hawaiian Islands. It will be at least 10 days in length. At the end of the cruise we will be flying back to Vancouver. If you wish, you can spend a couple of extra days in Honolulu before flying back. 1) Our fabulous travel agent, Donna will be organizing the travel arrangements for our cruise again. Ask Donna about the monthly pre-payment plan. Take a bow Donna! 2) Our plaid wearing sidekick, Celina will be doing her (in)famous daily newsletters and updating this blog. Hey wait a minute...that's me. 3) We will have ONE class per day when we are at sea. We received feedback that two classes a day is too much. In this way, guests can bring their projects from home to work on in the afternoon, or just work on their tans at the pools. Jessie will be teaching classes and I'll be announcing other instructors at a future date. 4) We will have a card swap and play the wood mount game again - these were hits. OK, we have figured out how to do the wood mount game so that the same person doesn't get her own stamp back. You two ladies know who you are. 5) Christmas cards were nice last year, but classes next year will have other occassion cards as well. 6) The goody bags were a hit last year and they will be a hit next year. We'll keep you posted on the details. On behalf of myself, Jessie Hurley, Donna and Celina, I would like to thank all the wonderful participants of this wonderful cruise. Thank you to our guest instructor Diana Crick. Thank you also to the spouses who were good sports in supporting their cardmaking wives and their new friends. New friendships were made, new techniques were learned and a great time was had by all. 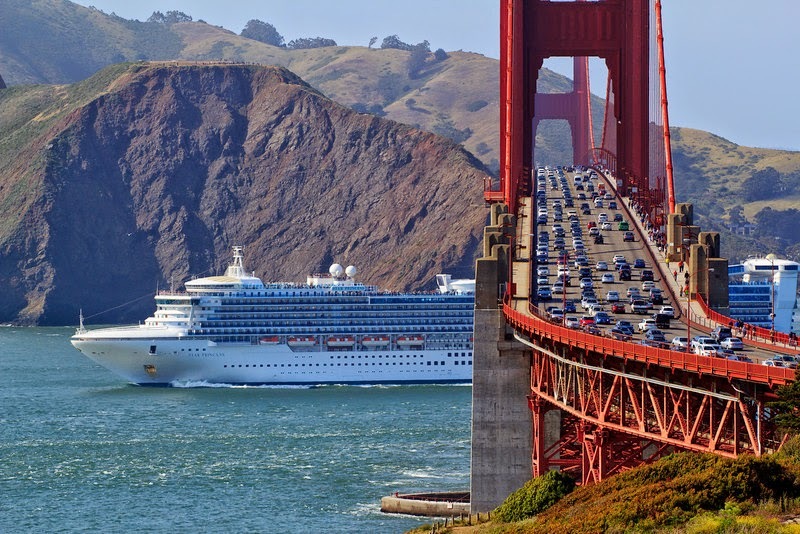 We had a few "bumps" which will be fixed for next time, Yes, there will be a next time with another cruise. We will cherish the wonderful memories of OTT lights and Joann's in Alaska, Pandora bracelets, Florida invitations, a new appreciation for Chilliwack, facials, Herman, cute waiters, nightly newsletter deliveries, blinking drink lights, and the list goes on and on. 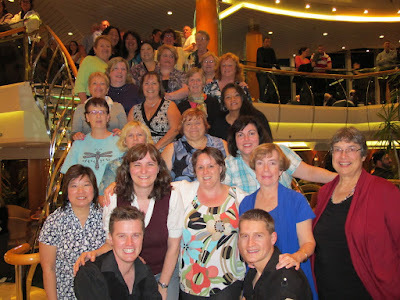 Who could ever forget our attempts at getting group pictures at the exact time cruise entertainers decided to do a dance show, right in front of all of us. Did you miss taking a picture of a special dinner or funny incident? Well, you won't have to be disappointed any longer. We have set up a SailingwithScissors Photobucket account that contains albums of guests who have downloaded their pictures. If you need the password, please call me at the store. If you haven't downloaded your pics to the site, please do so - we'd love to see your pics. Here is another card made from the awesome items in the goody bag. 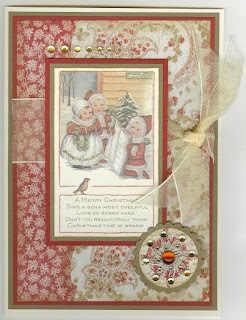 The picture is leftover from Jessie's Vintage card class. Jessie did an awesome technique in which one side of wide double sided tape is stuck on the picture. The backing of the other side of the tape, which is on the picture is removed. Then, sugar beads are sprinkled over the picture to cover it completely. You get a really nice frosted effect. Our cardmaking guests received a really nice goody bag filled with beautiful paper, ribbon and embellishments. Here is a card made with the paper from the paper pack. The picture is an extra from Jessie's vintage class. Very nice.